Shutterstock is one of the best and most popular stock photo websites around. Their history, reputation, quality of service and affordable prices make them a favourite for many buyers across the world. But if their offers don’t adjust to what you need, or if you simply are the kind who likes to have options, you’ll love to learn about these great Shutterstock alternatives to buy cheap Royalty-free images online. So let's answer the question, what is the best Shutterstock Alternative? It's not easy to find the best alternative to Shutterstock but we are certain this quick list of stock agencies and offers will help you find the one which is best for you: If you are on a restricted budget? 99club by Stock Photo Secrets Shop is a great deal. If you need everyday images? iStock is good and even cheaper with their subscriptions. If you are a Creative Cloud user? Go with Adobe Stock and their full integration in Photoshop and Co. If you need lots of images? Low Volume by Stock Photo Secrets Shop can be the best for you. We collected and compared the best alternatives to Shutterstock in the form of offers comparable to the former in price, number of images, usage rights, image resolution and quality of service below. And picked only the cream of the top, as all these Shutterstock alternatives are included in our list of the Best Stock Photo Agencies! For more details on each offer, read our list below! The Stock Photo Secrets Shop is a microstock agency designed specifically for small and medium-sized businesses. Our offers are thought to meet their needs in terms of service and budget, and no one does it better than our star product: our 99club plan gives you 200 XXL royalty-free stock images for one year for just $99, which means $0,49 per download! Certainly, a great Shutterstock Alternative if you like their low prices per download, but can’t work with their high volume monthly plans. It’s easy to see why 99club is the best and most fitting Shutterstock alternative for those on a restricted budget: not only it is as cheap as the former, but also more flexible, with lots of benefits, and from a reliable agency backed by industry professionals. What’s more to ask? Want to learn more? Read our 99club review. Ready to buy? Get your 99club membership right here! iStock (previously known as iStockphoto) is one of the oldest and most renowned stock photo agencies, famous for their highly curated library which hosts millions and millions of high-resolution images divided into two main collections: Essentials (budget, non-exclusive content) and Signature (high value, exclusive files). Both collections have high-resolution photos and vector graphics. Additionally, they offer stock videos and audio libraries. There are plans with access to Essentials only, which are far more affordable, and subscriptions with access to the entire library including Signature that, while a bit more expensive, are still fairly affordable and add a lot of value with content you will not find elsewhere. See all details about iStock pricing here. So what do you get with an iStock subscription? Subscription types – Monthly and yearly – two subscription types, iStock Essentials (basic content and non-exclusive files) and iStock Signature (for exclusive content plus non-exclusive as well). What makes iStock such a great Shutterstock alternative? That just like the latter, they offer stock photo subscriptions up to 750 downloads per month, but having two image categories and pricing tiers, you have a lot more options in terms of price, according to what kind of photos you need, and some are even cheaper than Shutterstock! If you like this stock photo agency, you might it useful to discover some iStock Alternatives as well! 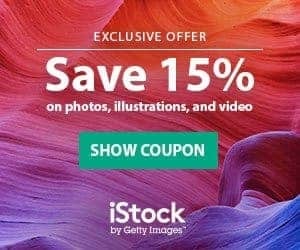 But here comes the great news: For a limited time, we have a great, exclusive iStock Promo Code that gives you 15% off in EVERYTHING! That's right: anything you want to download from their site, at a cut price! Grab our iStock Promo Code now, it's only valid for a limited time! To access these free image giveaways, all you need is to sign up for free at iStock and you’ll be able to download them – you’re not required to purchase anything! Adobe Stock is a stock photo service property of Adobe and built on the base of Fotolia stock photo agency library. It’s most notable feature is that is fully integrated into Adobe Creative Cloud platform, enabling you to access, surf, test edit and license images from its collection directly within your favourite image editing apps. They offer various subscription plans with access to a collection of over 60 million royalty-free photos and vector illustrations. They also have graphic templates, 3D models, video clips and more. Adobe Stock is a cool alternative to Shutterstock if you work with Creative Cloud tools in your design process. This service not only has subscriptions comparable to those of Shutterstock, and enough photos for you to have plenty to choose from, but more importantly adds value with its full integration with Creative Cloud that simplifies your design workflow greatly. So if you like to work with Illustrator CC and similar, this is definitely a Shutterstock alternative worth exploring! Under royalty-free license – avoid the legal risks of using creative commons images! Just sign up for the 10 or 40 downloads a month yearly plans (which costs $29,99 and $79,99 per month respectively) and you will get your first month free! To get your free trial started, all you must do is click on this Adobe Stock Free Trial, go to Adobe Stock and select the plan you want. Complete the registration and enter your payment details (you won’t be charged for the first month) and you’re done! Photocase is a Berlin-based stock photo agency offering artistic stock photography at very affordable prices. Their highly curated library is full of premium stock images with great artistic value and the authentic, modern aesthetics that is trending in the market. With so many years in business, this is a very reliable and professional service where you will find the kind of photos no other agency provides. Photocase is a fantastic Shutterstock Alternative if what you are looking for are unique stock photos, the kind of images you rarely find in Shutterstock’s catalogue. If you follow a more artsy and edgy aesthetics but you like low-priced images, this is the perfect alternative for you! What's even better: As a StockPhotoSecrets reader, you can get more Photocase photos cheaper thanks to our exclusive Photocase Coupon Code with 3 FREE credits + 25% Off! A deal not to be missed. Being designed specifically for small and medium-sized businesses, Stock Photo Secrets Shop has actually another great alternative to Shutterstock: our Low Volume plan. This is a limited-time and exclusive offer which gives you 600 XXL royalty-free stock photos for only $199 a year! That's only $0.33 per photo! Low Volume is a remarkable Shutterstock alternative for any business needing hundreds of images for marketing and promotional efforts, but working with a tight budget. Sure Shutterstock gives you up to 9000 images in a year, but they charge you as much as $199 per month, and if you don’t use such a huge amount of downloads, you’re actually losing money. Our Low Volume deal gives you a considerable amount of photos with a flexible yearly cap to download them, for a much lower, one-time fee. Notice as well that Shutterstock has a 600 a year subscription, but limits it to 50 downloads per month and charges $1188 ($99 monthly) for it. It’s a no-brainer Low Volume is a better option! If you want to seize this deal, do it quick! It’s a limited-time offer and won’t be available for long! Depositphotos is a well-established stock photo agency with a comfy spot amongst the 6 best companies in the space. They have a remarkable service, offering over 55 million images under a Royalty-free license, and a wide pricing offer that includes stock photo subscriptions at very affordable rates. Depositphotos is a very good alternative to Shutterstock if you like the tailoring of the plans at the latter, but you want better prices. Sure Depositphotos’ library is much smaller than Shutterstock’s but it’s still incredibly large and varied, and their plans come at a lower cost and with a bit more flexibility. So it’s certainly an option to explore if you’re working on a limited budget! And make it even more worthwhile for you! Our special Depositphotos Coupon Code gives you 5 FREE images plus 15% off in your purchase! To grab free stock photos from this agency, all it takes is to sign up for free as a member. That’s it! Once you’re logged in you’re able to download any and as many free files as you wish! Let’s talk briefly about Shutterstock – after all, there wouldn’t be a need for Shutterstock alternatives if there was no Shutterstock, right? This is a stock photo agency under the microstock model: they sell high-resolution images (this means photography and vector illustrations) online under a Royalty-free license, at very low prices with a minimum payment requirement. They were the pioneers of the stock photo subscription, a buying model for which you agree to a fixed monthly fee in exchange for an also fixed number of image downloads per month, with incredibly low per-image rates. While now they have several options in the volume of images, their star product has always been their plan for 750 photos per month for $249 monthly or $199 annually. This is what made them popular from the beginning, as lets buyers get high-quality photos for just $0,26 – $0,33 each. But there are many more reasons for their success. They host the world’s largest online stock photo library, with over 220 million files and counting. They implement the latest intelligent technology for image search, they have additional media catalogues like stock footage and stock audio, and they include a free photo editor in their services, for example. You can read more in our Shutterstock review. This is why so many buyers choose Shutterstock. If you want to join them, take the chance to use our exclusive Shutterstock Coupon Code with up to 15% off in your purchase! Buying images royalty-free will now be easier than ever! Not only you get an awesome discount from the very popular Shutterstock, but also 6 awesome alternatives to Shutterstock to download royalty-free photos cheap! 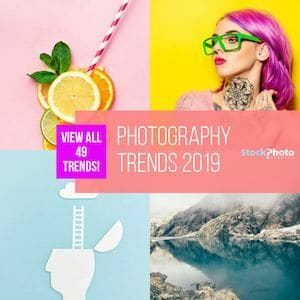 If you are not in a position to spend money in photos, our bonus info on free stock photos from these reliable agencies comes in handy, as you will get professional imagery that is safe to use in commercial projects, a lot safer than creative commons photos for sure. sorry to hear that it did not work for you. Yes the deal for 5 free images should still be active. I have forward your request to DepositPhotos, they will check and then get back to you via Email. Let me know if this has worked for you. The StockPhotoSecrets Shop is a stock photo agency developed by industry veteran Amos Struck and his team, though specifically for small and medium-sized businesses. It aims at providing stock photo solutions to their image needs, that fit in everyone's budget.